What's going on in the Yard Now? Lots of things are happening in the yard right now as the growing season for a lot of plants begins to switch from actively growing to the process of dormancy. Dormancy is clearly many weeks away yet plants are responding to weather and day length changes. More recently gardeners have noticed good growth on some of the vegetables since we have had the warmth of August to really push some of our vegetables. Onions on the other hand have begun to slow and the tops begin to collapse and fall over. Once that happens, they can be dug, allowed to dry off in a shady spot before being tied, bagged and stored for later use. Any fall crop cabbage will soon be heading if it has not already begun. Perennials may be showing a more dramatic change. Nearly all of the summer flowering perennials have finished blooming and now the foliage has started to lose their luster. 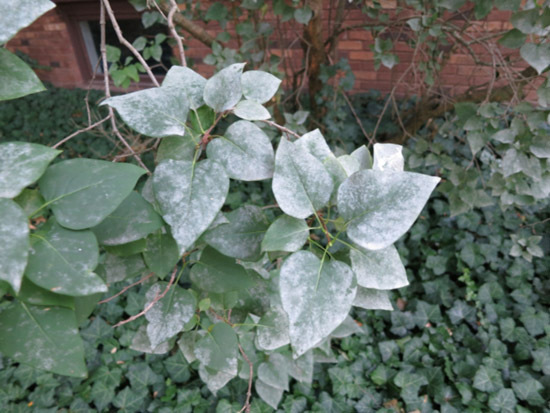 Powdery mildew can be found on lots of foliage as evening temperatures and the humidity levels change. Peonies and Phlox are a couple of examples where powdery mildew moves in quickly. Powdery Mildew also shows up in our landscape plants as well. It is common to see it on Lilacs and some of the viburnums. The perennial weeds in the lawns are looking very healthy right now as they continue to establish themselves from a seedling this spring. Dandelions as everyone knows have a very deep tap root that stores lots of food for next year. As a seedling, pulling or digging them up will take care of the problem. Wait too long and any kind of removal will generate 3-5 new plants growing off that leftover root in the soil. Pulling, hoeing or digging those loose works well in a bed. In the lawn, once there are more than you want to tolerate, a broadleaf weed control product could be considered. Fall is the belter time to use a product like this since the weeds are sending energy into the root system and will move the control product downward as well. In the fall dandelions and plantains slowly fade away while the lawn grasses fill in. There have been many calls to the Master Gardener help desk about Rust this year in the lawns. Rust is present about every year, yet the weather conditions this season has really promoted it. Walk the lawn and your shoes turn an orange brown color. The color you see is actually the rust pustules that are going to overwinter. Lawns that have a higher percentage of perennial rye grass in the lawn will see more rust. This will resolve on its own as the rust life cycle is now nearly done for the year. Watering the lawn so it is dry by night will greatly reduce rust in the lawn. Rust is a disease that likes grass plants that are stressed. Rust grows slowly, so encouraging good growth will outpace the spread.